Renee Morgan, a senior baritone player from Canton, mends uniform pants. Uniform rips and tears are the common casualties of having a dynamic field show – a show where nearly 400 band members move at 180 beats per minute, and student Renee K. Morgan is one of the volunteer seamstresses who come to the rescue. Morgan, a senior baritone player at WCU majoring in music education, was 15 when she started sewing, first teaching herself and then taking classes. It’s a skill that landed her a job at the now-closed Aspen Glow Inn, where she repaired curtains and linens for a year and a half. 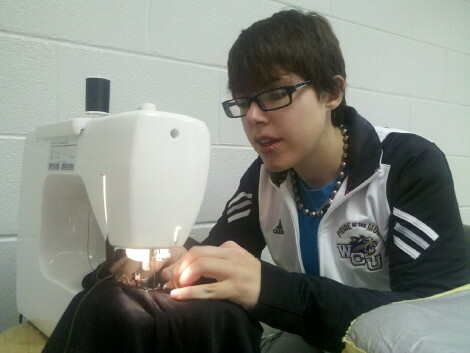 During the fall semester, she spent as much as eight hours a week helping fix torn uniforms or adjusting hems. For Morgan, it was about giving back to the band that reached out to hers when she attended Pisgah High School. When floods in Canton damaged the school’s field, WCU and the Pride of the Mountains Marching Band reached out to the high school and the band to help and performed at one of the games. In addition, the high school played its home football games at WCU’s stadium. Morgan said that meant a lot to her, and assisting with the uniform crew this year offered her a way to give back.